Here is our list of useful tips that can help your garage floor to retain its beauty and resilience for as long as possible! Your Scottsdale garage floor is probably not on top of your home remodeling priority list. Regardless of whether you do it yourself or have a professional install your Epoxy floors 85259, make sure it comes with a generous warranty. This is less often the case with store bought products, plus proper application is hard to prove, but if you have a professional company apply the floor coating in your garage make sure they are reputable. That means they should be licensed, bonded and insured. Also check on their ratings on sites such as Yelp or other consumer rated sites. Your newly epoxy coated Scottsdale garage floor is looking great and to ensure it stays that way, you need to clean it regularly. Luckily, coated floors are easy to clean. Often just sweeping up loose dirt is enough. Epoxy floors 85260 are super sturdy, but you still want to follow manufacturer guidelines to extend the life of your floors. Therefore you should clean up chemical and oil spills as soon as possible and protect the floor from sharp objects such as dropping tools. While the epoxy floors 85266 coating can make your concrete floor shine, easier to clean and more resilient to stains and other issues, it cannot fix existing issues. So if you are contemplating having your concrete garage floor epoxy coated, keep in mind that it will not fix any existing issues, nor will it hide it. To get the most from your coated surface, have the concrete substrate repaired first. Clean off debris, fill cracks and consult your local floor coating contractor. He can tell you if your floors are ready to be coated and which floor coating services best suit your needs. Not all floor coatings are created equal. Do not be tempted by companies with low ball quotes, their floor coatings most likely will not stand the test of time. Polyaspartic floor coatings are among the best you can get. They look fantastic, can withstand the hot Arizona temperatures and have great substrate adherent properties. To find out which coatings can give your Scottsdale garage floor the look and endurance you desire contact your local floor coating specialist. 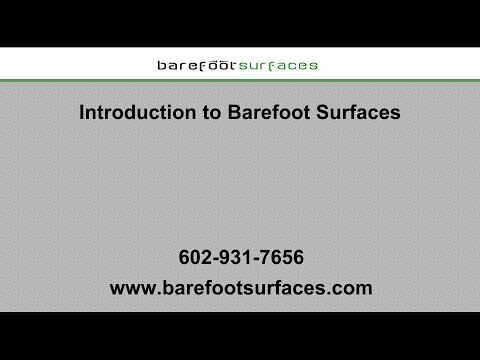 Barefoot Surfaces is your local epoxy and polyaspartic floor coating expert. We gladly answer your questions and help you to create the garage floor of your dreams. We also have friendly and professional patio epoxy floor coating contractors in Scottsdale to help transform your outdoor living space! To learn more or to schedule a free estimate contact us today.